One of the principal drivers of productivity growth is innovation, which includes not only technological but nontechnological innovations. A key element of nontechnological innovation is skills which drives a large part of productivity improvement at the organizational level. Scholars have enunciated that innovation in services is brought to market through collaboration, asset orchestration, technological adoption, and knowledge-based competencies. To this effect, the role of human capital in promoting service innovation is identified in the innovation literature. Further, service innovation in a service ecosystem is centered on the resource-based definition, where services are treated as an application of competencies, making use of knowledge, skills and experience of all stakeholders. In addition, the process-based definition of service highlights the important role customers play in the service production process, where the customer themselves are an input to the service delivery process. Amidst resource limitations and acute competition, service firms need to therefore not only upskill the human talent of their employees and customers, but also reconfigure, renew, and redeploy resources and capabilities on an ongoing basis. This indeed highlights the importance of capabilities required to facilitate the creation of sustainable competitive advantage, which are not ubiquitously available in large proportion amongst service organizations. It is in this context that we identify and explore in this chapter the role played by service firms’ learning capacity to deploy operational and dynamic capabilities across service systems. 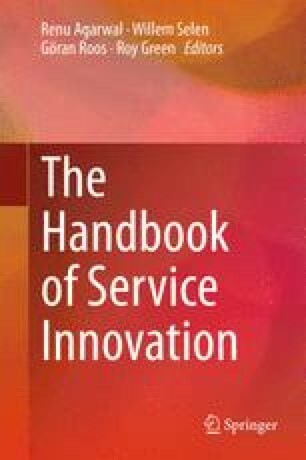 This chapter highlights an entire suite of dynamic capabilities which are made up of higher order competencies, such as relationship capital, organizational learning, collaborative agility, entrepreneurial alertness, innovative capacity, and customer engagement, which are instrumental to service firms for innovation.